Self-adhesive infoframe with fold-back magnetic frame for posters and notices in 70x100 cm format. Self-adhesive infoframe with fold-back magnetic frame for posters and notices in A2 format. Self-adhesive infoframe with fold-back magnetic frame for posters and notices in 50x70 cm format. 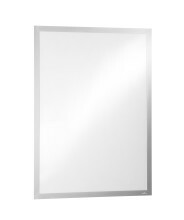 Self-adhesive infoframe with fold-back magnetic frame for posters and notices in A1 format.